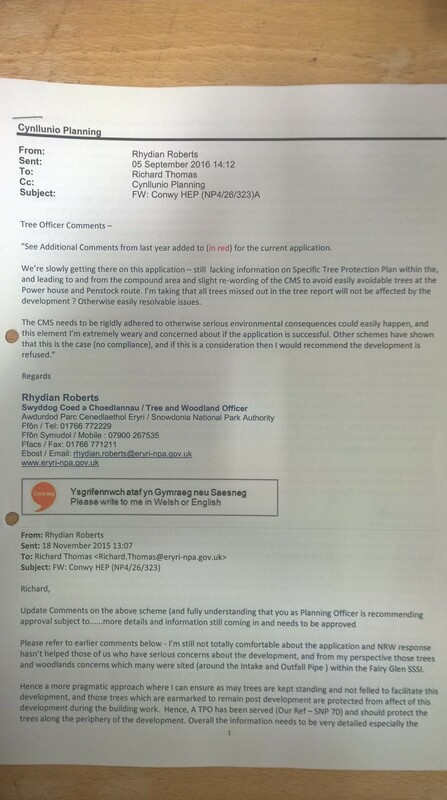 In common with the Senior Ecologist the National Parks Tree Officer has serious concerns about the proposed Conwy Falls HEP scheme. The problem lies with the incredibly restrictive CMS (construction method statement) the developer had proposed in order to convince the National Park that serious environmental damage will not occur. In the environment concerned this CMS is extremely unlikely to be achievable and past experience on other hydro schemes, such as the Afon Las in Nant Peris, has caused the Tree Officer to advise the precautionary approach the National Park is meant to employ when assessing developments in protected areas. The CMS needs to be rigidly adhered to otherwise serious environmental consequences could easily happen, and this element I’m extremely weary and concerned about if the application is successful. Other schemes have shown that this is the case (no compliance), and if this is a consideration then I would recommend the development is refused.